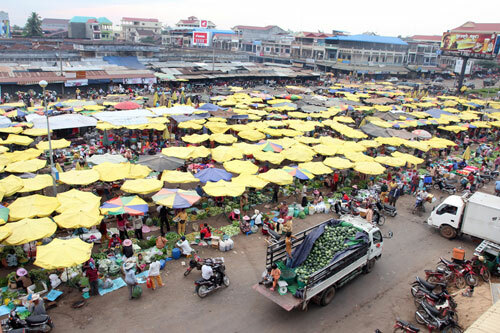 You can find the main market in the center of Stung Treng. 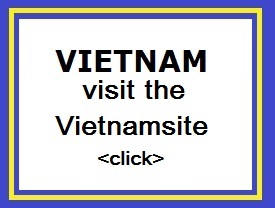 It is a bustling place, where the sale of goods from Laos, Vietnam, Cambodia takes place. There is also a small night market on the southwest side of the market, and there are also small drink and food shops near the Preap Son Guesthouse on the other side of the market. Want something special to take as a souvenir from the province of Stung Treng? Buy handmade, woven rugs. They are very artful and some are therefore costly. The products from Laos are not for sale elsewhere in Cambodia. The morning part of the market is open air and sells fresh produce including wriggling fish � can�t get fresher than that! There seems to be lots of different fruits and vegetables, that we don�t recognise but all very interesting. We will need a few recipes and cooking lessons when we finally get a house. The main market sells and offers all sorts: I had an excellent Pedicure for 2000R (less than half a dollar) and a fresh fruit smoothie for 1000R (a quarter of a dolla)r. They also sell clothes, gold, mobile phones, shoes, pots etc etc. 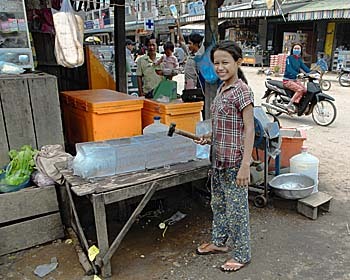 As it is quite common in Cambodia even small cities, such as Stueng Treng have at least one bigger market. You may also find a market in Stueng Treng centre. The parasols shelter the vegetable market, while the tin roofs behind shelter restaurants, gold dealers, butchers, textile dealers and more. Stung Treng is a unique province quite distinct from other Cambodian provinces in the Mekong basin. Extensive forests, intersecting rivers and streams and low population density characterize it. Stung Treng includes also the western chunk of the massive Virachey National Park, accessible from Siem Pang, a small beautiful town on the Tonle Kong. The province also features three big rivers the Tonle Kong, the Tonle San and the mighty Mekong with its hundreds of small islands scattered on the river stretch in Stung Treng Province.